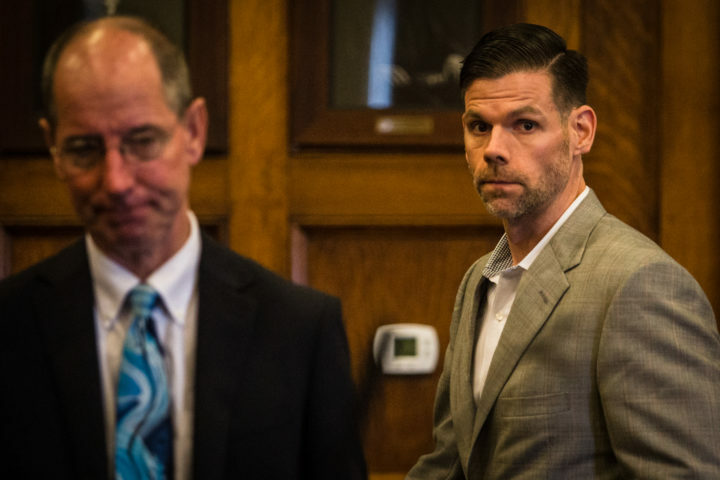 PORTLAND, Maine — The City Council on Wednesday rescinded a decision to hire the company of a Maine concert promoter who pleaded guilty to assaulting his former girlfriend, and voted to instead sign a deal with its national partner. The unanimous decision gives the city a degree of separation from Alexander Gray, whose guilty plea last year has stirred up public pressure for Maine cities to break ties with his company, Waterfront Concerts. But the practical implications of the vote to have Live Nation present concerts at the Maine State Pier instead of Gray’s company are unclear, as the national entertainment group contracts with Waterfront Concerts for shows in Maine and could do so in this case. 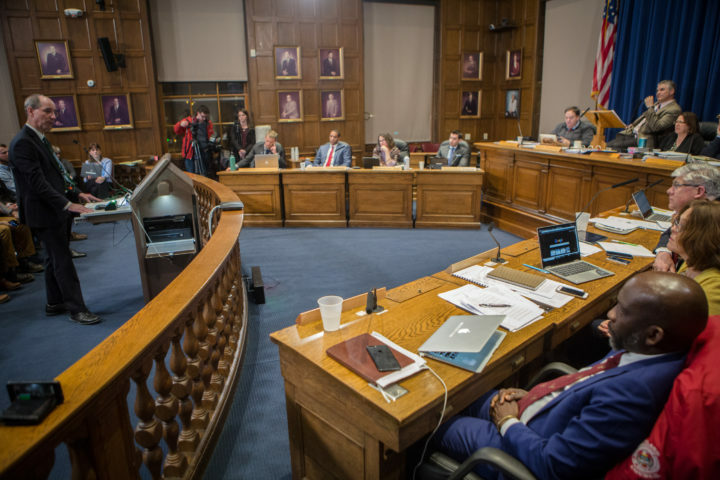 Nonetheless, the vote represents the most direct action to date resulting from public outcry over the prominent concert promoter’s October plea to assaulting Erica Cole. ”I genuinely can’t put into words how much it means to me for someone to say that they believe me and that I made a difference,” Cole said after the vote, breaking into tears. Concert promoter Alex Gray (right) walks into court in Portland on Oct. 10, 2017, with his attorney Gerard P. Conley Jr.
Public pressure ratcheted up earlier this month, when Cole published a letter online telling her story of surviving domestic violence and chastising leaders in Portland and Bangor for doing business with Gray’s company. Gray has maintained that he did not beat Cole, but told a Portland court that he accepted responsibility for the incident that led to her brief hospitalization in March. In response to Cole’s letter, the Portland councilors elected to reconsider their unanimous February decision to contract with Waterfront Concerts, which has put on the summer shows in the city for several years. Despite the council’s previous approval of the contract, the city had not yet signed one for summer shows at the State Pier, for reasons that are as yet unclear. It remains to be seen whether other cities where Waterfront Concerts puts on shows will take a cue from the state’s largest. Attorney for Alexander Gray, Gerard Conley Jr., addresses the Portland City Council on Wednesday night, stressing that his client was never convicted of battering his girlfriend, Erica Cole, as officials pondered whether or not to cut business ties with Gray. Before voting, Councilor Spencer Thibodeau addressed criticism from some Portlanders who said that shifting the contract to Live Nation was little more than symbolic. A vice president of Live Nation, Bob Duteau, said rescinding a deal entirely with Waterfront Concerts would send the message that Portland “is closed for business.” Duteau said he was not sure whether his company will contract with Waterfront Concerts for shows on the Portland waterfront, saying he might be able to bring employees up from Massachusetts to fill jobs now done by Mainers. City Manager Jon Jennings said he’s told Gray and his lawyer that the concert promoter should not attend shows at the Maine State Pier this summer. “I’m really proud of the city of Portland on nights like tonight,” Jennings said. Gray did not attend the council meeting nor respond to an email and phone call seeking comment Wednesday. He received a deferred disposition in his case, which means his guilty plea to misdemeanor domestic violence assault can be dismissed if he abides by a judge’s conditions, including that he not contact his ex-girlfriend. Gray’s lawyer, Gerard Conley Jr., stressed that his client was never convicted and urged the City Council not to publicly try a case that never went to trial. “Now there are people everywhere who are seeking to destroy — destroy — Mr. Gray and rewrite the narrative,” Conley said. Erica Cole speaks before the Portland City Council on Wednesday night asking officials to rescind their relationship with concert promoter Alexander Gray, who pleaded guilty to assaulting Cole, his former girlfriend. More than 20 Waterfront Concerts employees attended the meeting, which saw the council chamber packed to standing-room only. During the hours of public comment, many of them asked the City Council not to rescind its decision to contract with the company. Waterfront Concerts books shows at the city-owned Merrill Auditorium and a variety of other venues around Maine. Wednesday’s vote will not affect shows the company has already booked in Portland. Bangor, on the other hand, signed a 10-year deal with Waterfront Concerts after Gray had been charged but before he pleaded guilty. Officials there have said they cannot break the contract, but also that they must do more to address domestic violence. During the Portland council meeting, Cole’s mother said Bangor officials put money over her daughter’s well-being. Erica Cole hugs her boyfriend Seth Blais, while her mother Elaine Commeau comforts her, in a corridor at Portland City Hall on Wednesday night after the City Council voted to rescind its relationship with concert promoter Alexander Gray. Gray has pleaded guilty to assaulting Cole. BDN photojournalist Troy Bennett contributed to this report.